I’ve been on a mission, cleaning closets in my studio. I’m pretty proud of how the kit and bundle area turned out. Hopefully, it will save me time when I’m shipping. 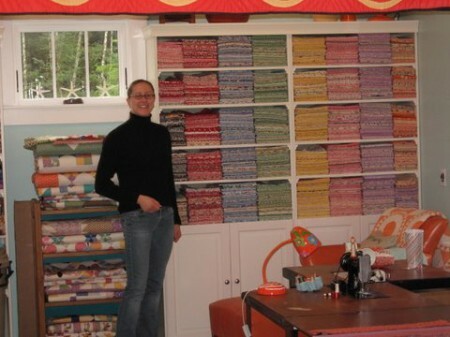 After that was done, I tackled the closet where I store batting, quilts to be quilted and quilts and quilt tops that are for sale. The batting is now neat and organized. 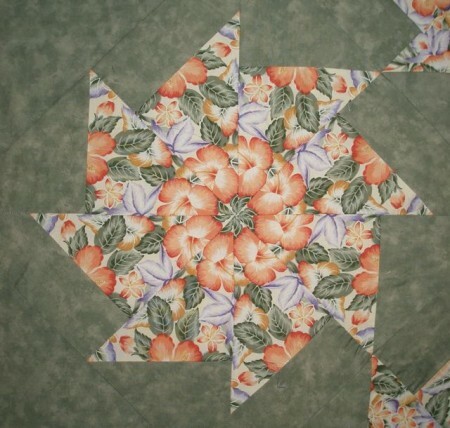 While I was folding up “projects waiting to be quilted” to put them back in the closet, I decided I had to add one more to the web store. 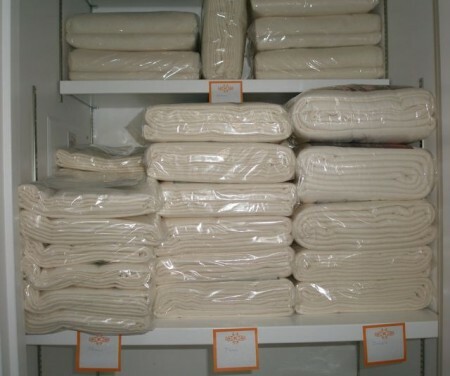 It’s this pretty queen-sized Stack N Whack. 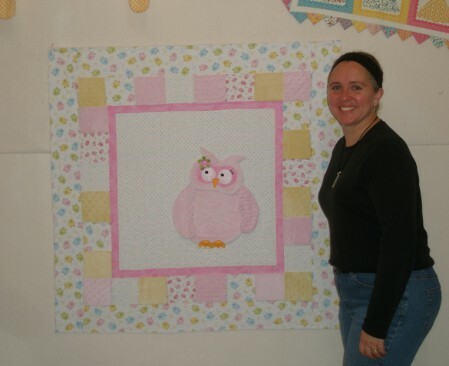 I love this quilt and I loved teaching the technique when I had my quilt shop. Every block comes out a little different. I fully intended to quilt this, but it’s been three years! So, it’s now listed on the web catalog. Maybe it can find a new home with one of you! Maybe you need a Christmas gift, but time is not on your side! I’ll never tell that you didn’t make it yourself. I even have the backing pieced for it. You can see it on the web catalog by CLICKING HERE. 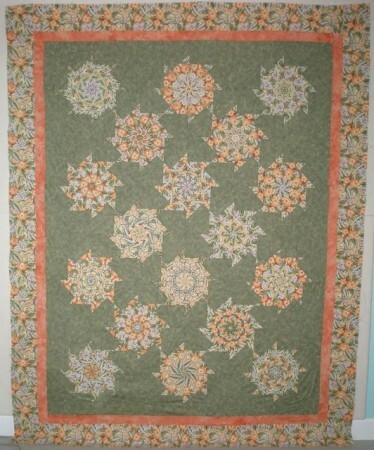 I have other new and vintage quilt tops for sale there, too. CLICK HERE to see them all. 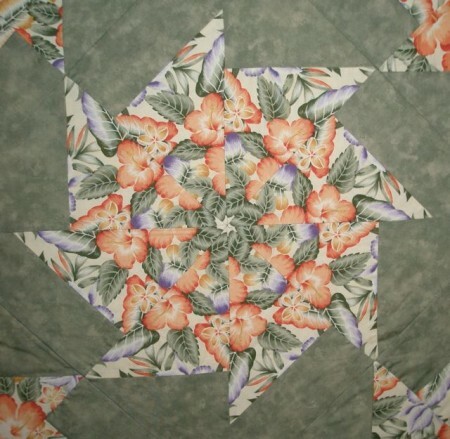 Categories: Everything!, fabric design, quilting Comments Off on Getting to Know…..ME! 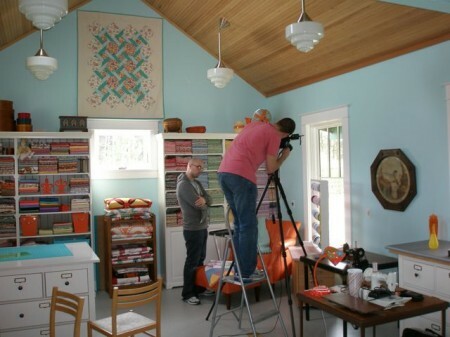 Back in April, I had a crew here from Quilts and More magazine, doing a photo shoot in my studio! It was incredibly fun. The crew included Adam and Joe…. Sometimes Joe was my stand-in. Imagine having a stand-in! Sometimes I had to do the work. It was fun to peek over their shoulders and see how fantastic their photos are. Now the magazine is finally out. It’s on newsstands now, or you can order it from me. It has the Getting to Know Karen Snyder feature written by Linzee McCray…. 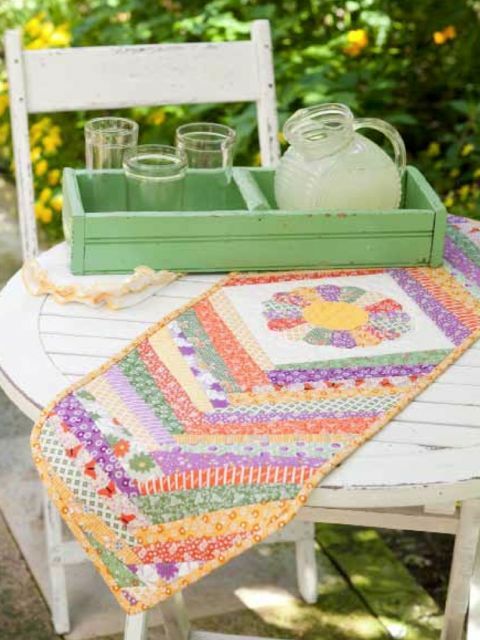 …and a table runner that I’ve designed, called Center Piece. They even asked me to provide kits for it! There’s more to this story, but I can’t tell yet! We still had Sunday left, and, as promised, we started it off with a bit of a sleep in. That was followed by Orange Rolls and Quiche–and I forgot to take pictures! 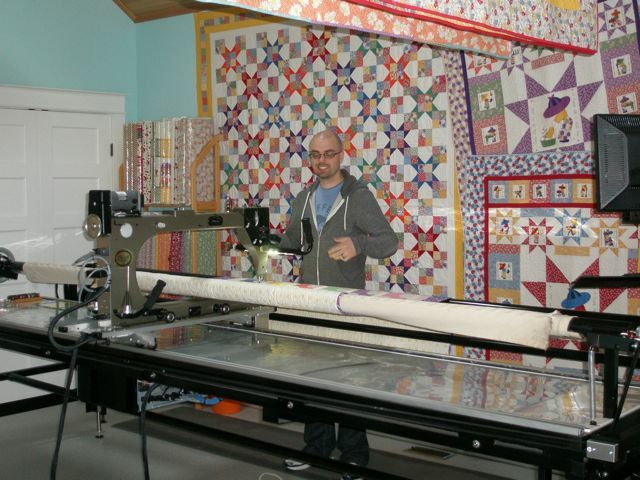 But, can you believe they’d been here two days and we hadn’t even walked across the lawn to the Quilt Studio? I’m sorry they never got to visit Anna Lena’s, but this was the next best thing. They were quite impressed by the rick rack holder Bob had built! Kasi wanted to finish her wonderful Owl Quilt, so I gave her a quick lesson in stippling and off she went! Didn’t it turn out fantastic!?! 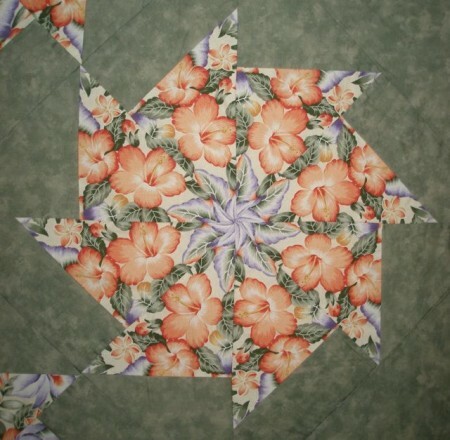 Kasi intends for it to be a floor quilt. 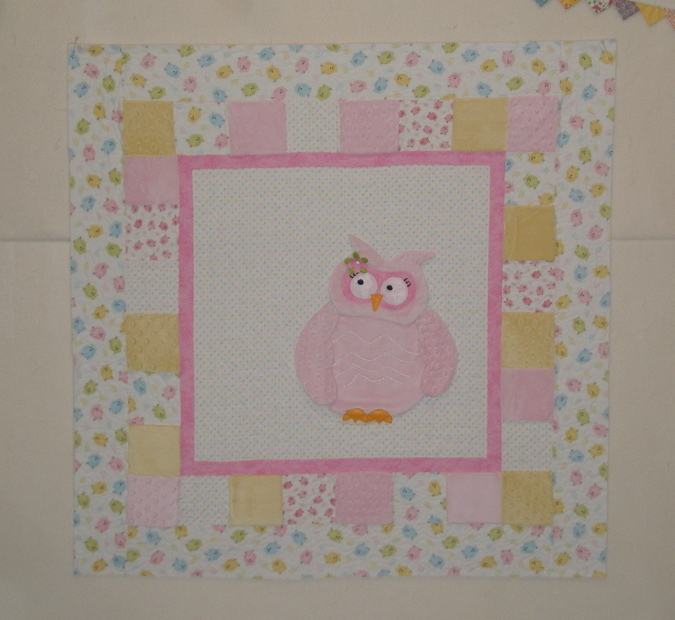 Some of the squares are Minky–so it will really be tactile for the baby. 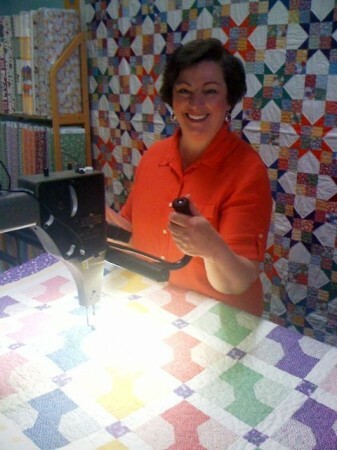 While Kasi was quilting, Kathleen was busy trying on my aprons. Here’s the Saucy Circle Apron. 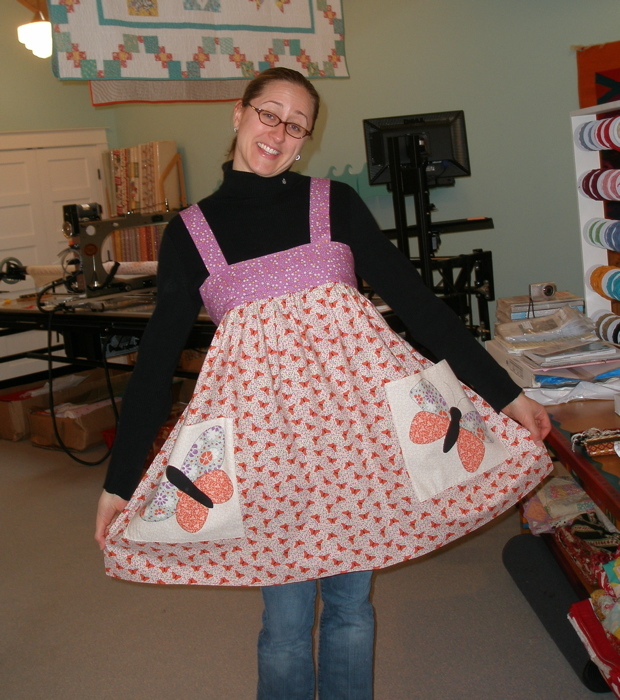 And the Lilly Apron made with my Butterfly fabric. 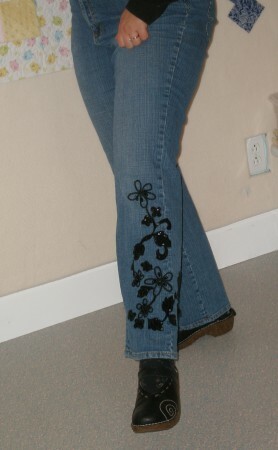 This one’s reversible, so she had to model both sides. Kasi had seen my Garden Trellis quilt in Studio post, and had to bring the first quilt she ever made–a Garden Trellis quilt! She made it for her mom many years ago. It was easier to pin hers up than to take mine down! 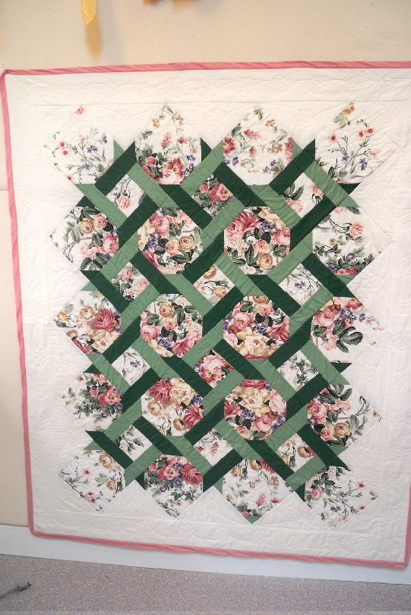 Since she had only stitched in the ditch when she made it, we decided to put it on the long arm and quilt some flowers in it. Won’t her mom be surprised! 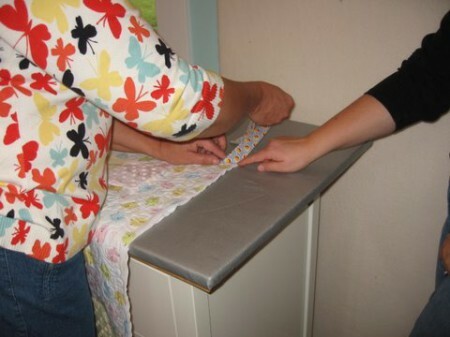 Here’s Kasi getting a binding lesson. I wish I had a photo of what Sally was doing during this time–she was Swiffering the floor! Not that it needed it, of course! Don’t you love Kasi’s embroidered jeans? Melissa, this one’s for you! 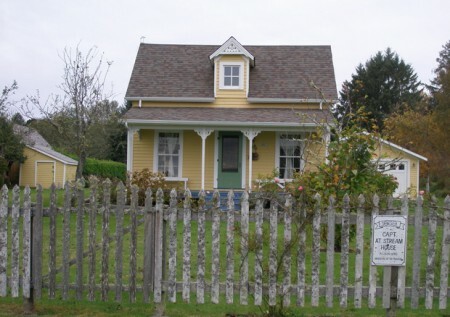 We had a great late lunch at Full Circle Cafe in Ocean Park,then drove through historic Oysterville. 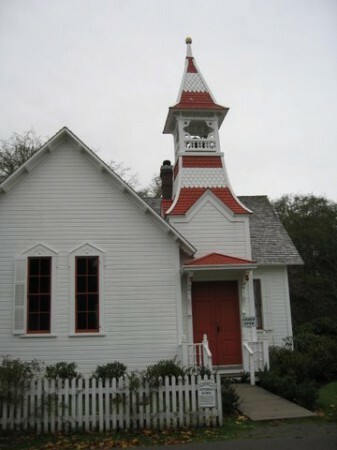 The old church there is so charming. And here’s one of my favorite houses. It was all over too soon,but, let’s check Kasi’s list and see how we did. Tour a cranberry bog ? 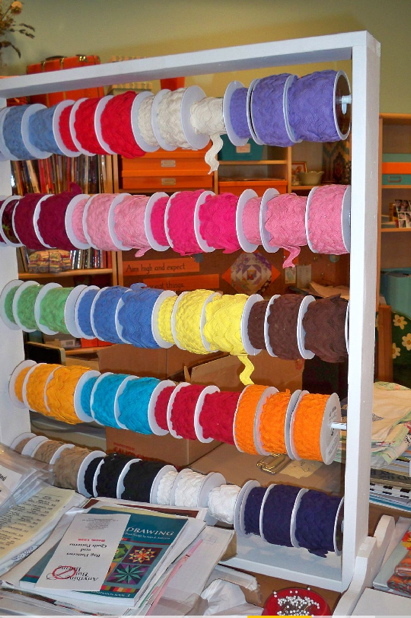 Meditate in that fabulous craft space ? Meet Poppy (now Lola) Oh no, poor Lola! Tour the little Swedish cabin ? Drink wine – well, I think Lemon Drops count! ? Eat yummy fun food at fun yummy restaurants ? Shop all/any cute little stores in downtown Long Beach ? Well, I guess it’s best to leave something undone–that way there can be a next time! Categories: Everything! Comments Off on Orange You Glad? Orange you glad you stopped by? I am! I’ve been in an orange mood lately. Well, it isn’t all that unusual that I’m in an orange mood–it is my favorite color, after all. 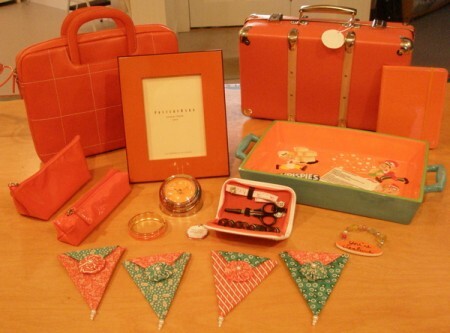 But, I must confess, for years I tried to hide my love of orange. It stems from a bad experience in the mid 1970’s. For those of you who remember, “earth tones” were the buzz word of the day. That usually meant avocado green and harvest gold. Insert gagging sound here. But, along with those two colors came burnt orange and rust. Yes, rust. As in, “See that old old hulk of a car out there in that field? The one that hasn’t run in years. Yes, I’d like that color for my home decor.” I got married and got my first house in 1974. (Okay, really weird thing happening right now. The Moody Blues Nights in White Satin is playing on my radio! Flashback to the Seventies!) But, I must proceed. In my new-to-me ranch house, I redid the kitchen/family room. The carpet–indoor/outdoor patterned carpet in brown and orange. 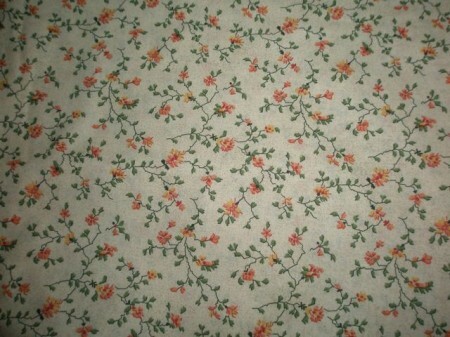 The wall paper–also orange. But not the pretty orange that I truly love. It was BURNT orange. That sounds almost as appealing as rust. We lived in that house for three years. When we moved out, I turned my back on orange. But, hard as I tried, I still really loved orange. For years I denied it. 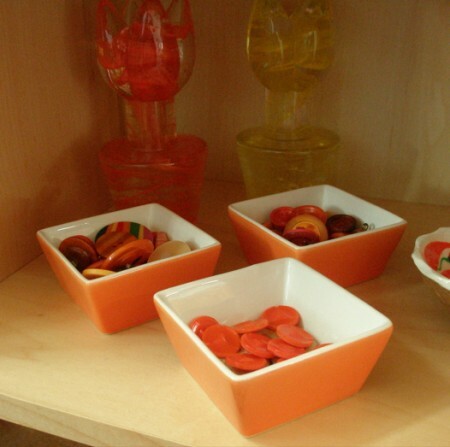 If I’d see something cute that was orange, I’d say things like, “Oh, that’s so cute–even though it’s orange.” But, slowly, with the help of a twelve step program in my mind, a few years ago I finally started admitting that I liked things BECAUSE they were orange. A whole new world opened up to me when I let orange back into my life. Now I’m surrounded by orange–happy orange–bright orange–gay orange! I have astudio full of orange. And have I mentioned that I have a great family and great friends? They help feed my orange obsession. 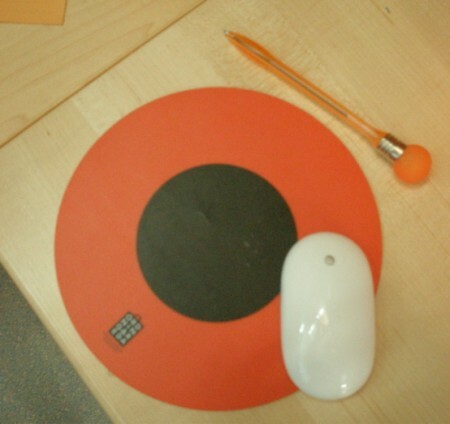 Here are the things I got for Christmas this year that are orange. 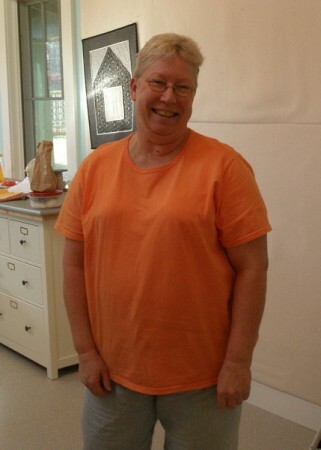 And yesterday, when my friend Robin came by to spend the day sewing, she even wore orange! Life is good when you love orange. 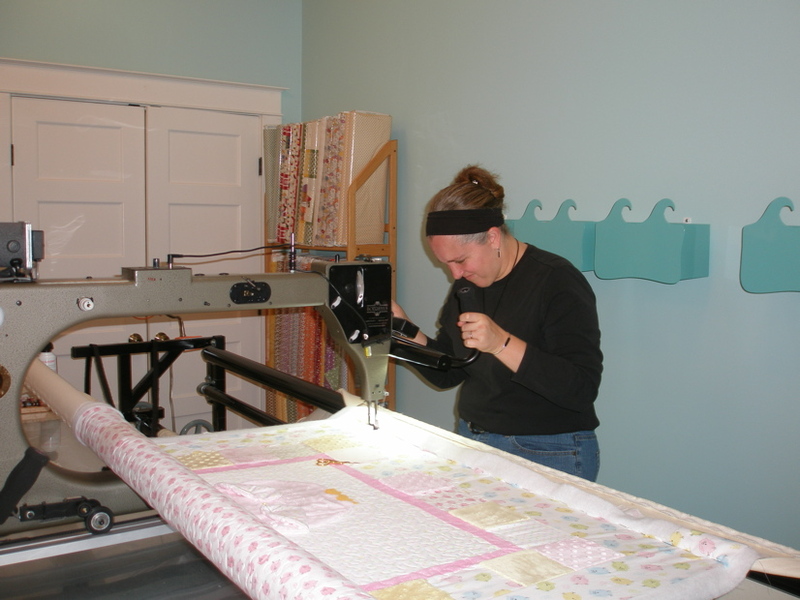 I had several questions about the shelves in my quilt studio after my last post. So here goes….. When we were building the studio, I looked through all kinds of magazines and catalogs trying to get ideas. 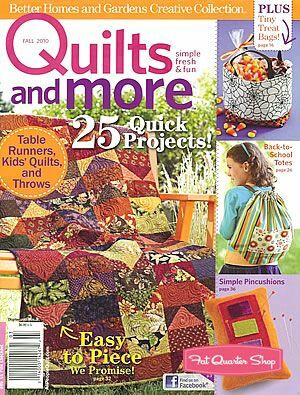 Then I saw that there was a new book coming out from one of the quilt publishers. 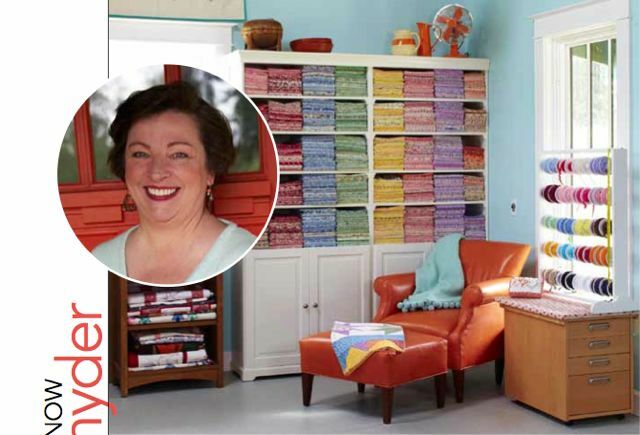 It was called Creating Your Perfect Quilting Space by Lois Hallock. I could hardly wait for the release date! As soon as it came out, I bought a copy and read it from cover to cover. 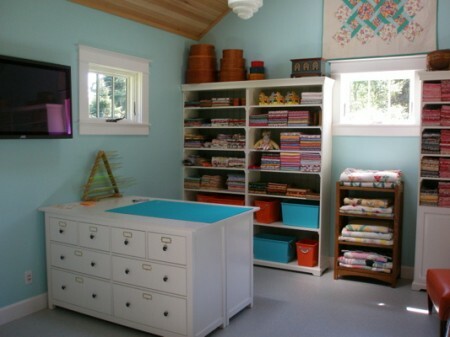 I wanted every sewing room in it! I wanted the green one! I wanted the knotty pine one! I wanted the one with the antique armoire! 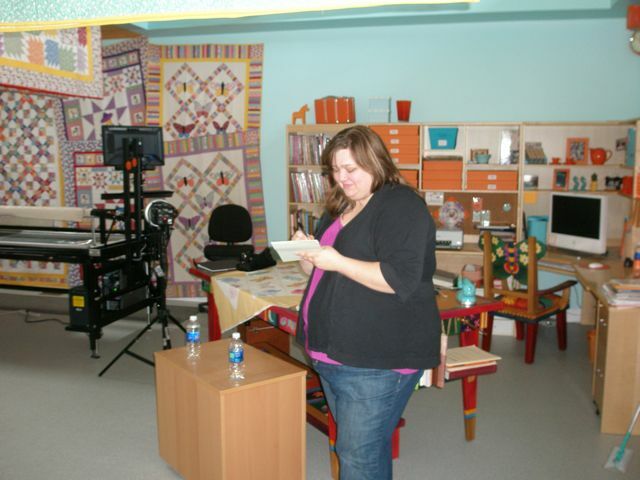 I wanted this Lois Hallock person to make me a pretty room and put me in a book! I read all of the helpful hints and thoughts on organizing, then I read the author’s bio. It said she grew up in Pennsylvania. Wow, that’s a long ways from Long Beach, Washington. But, it mentioned a web site. I checked it out. She lives just north of Seattle! Now THAT’S do-able! So, I bribed Lois with a weekend at Long Beach and hired her to consult on the studio. She drew out my layout, explained why ironing boards are big space wasters, explained why book shelves are perfect for fabric storage, talked to me about proper heights for cutting and sitting and sewing. But, best of all, she recommended IKEA. But I LOVED those Pottery Barn units that I’d seen in the PBK catalog. But, dang! They were expensive! So, here’s what we did. Bob and I went to IKEA, found shelving units that we liked, and dressers that we liked and would work for cutting and ironing surfaces and brought home all these flat boxes. Be prepared for lots of assembling if you buy IKEA stuff. Oh, and no words in the instructions, but great pictures! Now the one thing that set those Pottery Barn shelves apart was the placement of the doors–not at the top, not at the bottom, but just above the bottom shelf. So clever. So artsy. So glad I have Bob! The IKEA shelves were made so that you could put doors on the top OR the bottom, but not in between. Enter Bob. Sure, he says, he’d love to figure out how to do it some other way than the instructions say. Well, okay, not really love it, but he must love me, because he did. 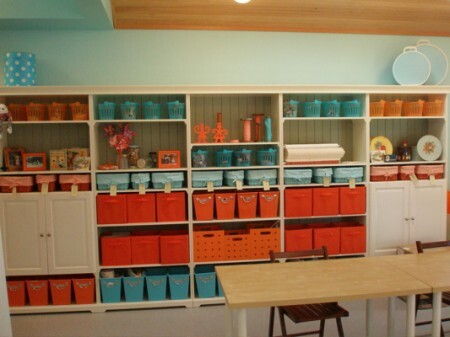 Then you need my sister, Sally, to find you all kinds of great bins and baskets to fill up your shelves. Didn’t she do a good job? She even found the Pottery Barn basket liners on close-out sale–and they were orange and aqua! They were too big for my baskets, but, guess what? 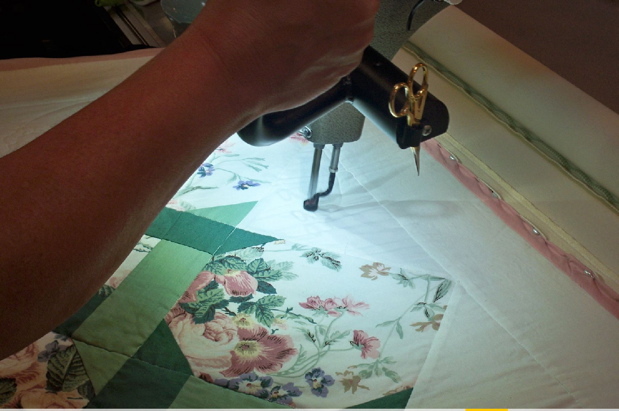 I know how to sew! 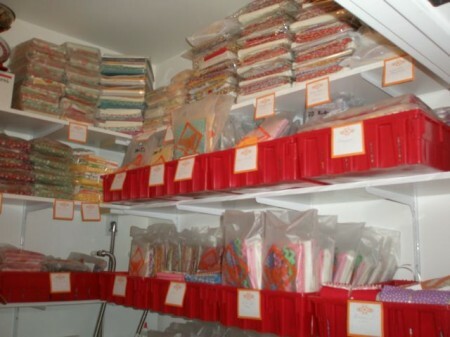 There are 5 book cases in the long wall unit, then two double sets for fabric storage. On those, I let Bob put the doors on the bottom! We bought two dressers for the cutting surface and put them back to back. It’s a great surface, and great storage, too. We also bought an additional dresser and Bob made an pressing surface for it. More storage and a great, big place to press (or pile things–no, wait, I don’t do that anymore!). The corner desk unit is also an assemble-it-yourself, but it came from Dania. 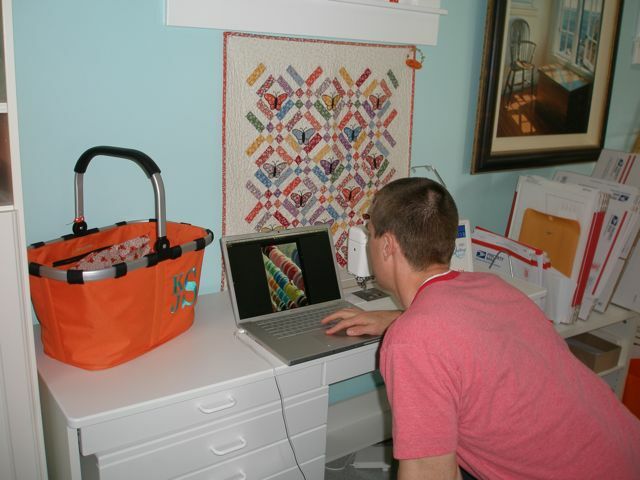 The drafting table and butterfly chair were a treat to myself and made by a company called Sticks. Now, regarding the new resolution for organizing. I was gone over the weekend, and on the long drive home decided that the best way, the way that might work for me, is to spend the first hour of everyday working on organizing. It has to be the first hour, or I’ll never get to it. So, this morning, when I heard Bob get out of bed, I jumped up (well, I stiffly eased my way out of bed), pulled on my sweat pants, and headed to the Ann Frank room–my equivalent of an attic–and dug in. I made some real progress and plan to be back in there with my timer tomorrow morning! I’m Karen Snyder and I approve this message!